I had planed to do this half marathon run yesterday but life got in the way. I didn’t plan on running it this morning; its rare when I run in the mornings because my body seems to do better in the evenings, BUT… I woke up this morning 5:30 AM yearning to run; it was still dark so I rolled out of bed and started getting ready. It didn’t stay dark long by the time I washed up, brushed my teeth, had coffee and pandesal (I like to dip my pandesal in my coffee) the sun was moving its way into the sky. I downed my morning supplements, vitamins and two 1000 mg Salmon Oil pills; my doctor has me taking them daily. I could already feel the humidity as I put my Zensah, Injinjis and Saucony Shoes on. I was out of the house at 6:35 am it was 66 F / 19 C with Zero wind and 85% humidity. I knew I was in for it. I decided I’d run down to and down the ‘Strand’ which is the road that runs between Impearl Beach and the City of Coronado (Coronado Island). This of course means that I would have to run the ‘gauntlet’ which you know, if you have read any of my other blog entries, is a place where rude bike riders frequent. The first 2 miles felt good running even though the humidity was making me sweat buckets; but I had my water so kept hydrated. The burping of fish oil was the worst! ack! seemed like every 1/4 mile or so the fish oil would come gurgling up; horrible taste. I attempted to stay under a 11:30 pace and did pretty well, except for those times my mind wandered into deep thought – I would totally loose track of my pace or for that running at all. I’d come out of it and look at my running watch and see 12:00 and have to pick up my pace. The last two miles is where I started to slow way down; but then again those are where the hills start the 178 ft climb. Other then the pee stop at the 6 mile point the run was constant even the signal light seemed synced to you running, changing to green just when I ran up on them. Mile 7 was another first for me I used a Cliff GEL shot for the first time; it was not enjoyable way too sweet and thick more like the consistency of chilled honey then gel. Yuk.. Seemed like it made me more thirsty as well. But it was the only gel pack that didn’t use High Fructose Corn Syrup. Mile 7 is also where the sun started to feel like it was burning my skin in addition to hitting me dead on the rays were also bouncing off the water. I felt like a Lobster in a hot pot of water. At mile 10 I wasn’t sure if I was going to make it but kept going. Getting up the hills at the end of the run really challenged me and took pretty much all I had left but I did it! 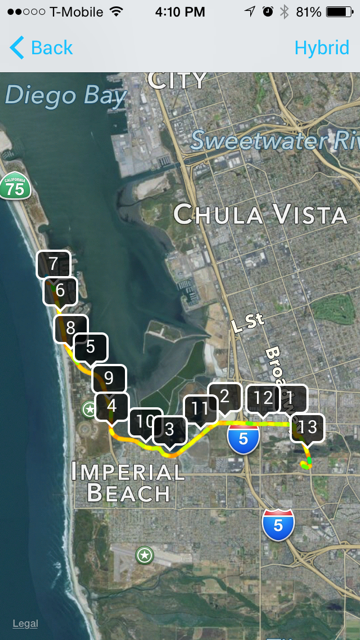 This entry was posted in Running and tagged 13.1K, Bayshore Bikeway, City of Coronado, Coronado Island, Half Marathon, running, San Diego Bay, Silver Strand, South Bay Salt Works, The Strand. Bookmark the permalink. Fish oil burps are the worst.